Yesterday, I compared four kinds of silk used in hand embroidery. 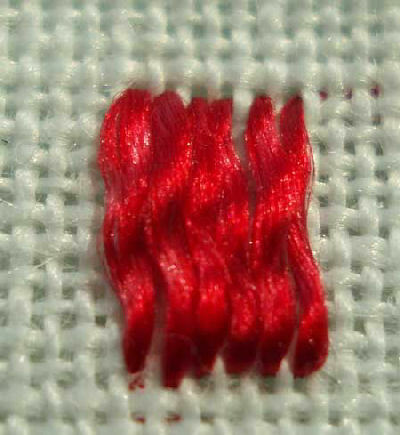 Here are some photos of a few stitches in each type of silk. I think it would be heaps of fun to work up an embroidery sampler using all my favorite silks – perhaps I need to add that to my list of things to do! The first silk thread sample is worked in Soie Gobelins. I’m working on Edinburgh linen (36 count). From left to right: straight stitch, which would be the equivalent of a satin stitch, if the thread filled the area. Gobelins is too fine to fill an equally spaced area on 36 ct. fabric. However, it makes great very fine lines – the two parallel lines show how it can be used to outline. 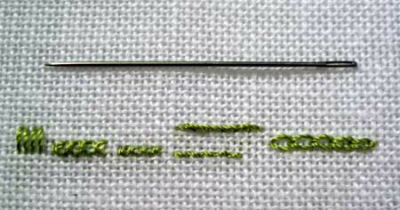 The top line is stem stitch and the one below it is backstitch (Holbein stitch, actually). To show you the coverage for cross stitch, the second set of stitches on the left is cross stitch over two threads, and the tiny set right next to that is cross stitch over one thread. The last set of stitches on the right is chain stitch. The needle above the stitches (to give you some perspective on the stitches and the fabric) is a #9 crewel (it’s pretty fine). Here’s the Soie Perlee. You can see that it fills the space better in the satin stitch on the left. To the right of the satin stitch is cross stitch worked over two. I think it’s a bit bulky for that, but it certainly gives a good fill. It’s far too bulky for cross stitch over one on 36 count fabric – shown are half-cross stitches (angled stitches over one thread). It works fine for backstitch (the bottom line) and stem stitch (the top line). This is the separated Trebizond, worked in individual holes right next to each other. You can see what a nice satin stitch it make. I like the waves! On un-separated Trebizond, I could not stitch through the 36 count fabric without a bit of a real squeeze. This is one ply of Soie de Paris, separated from the six-ply strand. It’s about as fine as the Soie Gobelins. I think it’s very nice for cross stitch over two on the 36-count fabric. The Soie de Paris in one strand works great for chain stitch, too! Thanks for showing these threads and how they look stitched. Speaking of twisted silk, I especially enjoy Eterna #8 and buttonhole silk. Do you know of an embroidery thread that’s recycled? Thank you for showing us the four kinds of Silk Thread used on Edinburgh Linen (36 count).